Floors looking dull? Wondering if a floor stripping and waxing services is right for you?Our floors in Alberta take a lot of abuse. All the dirt and salt from the winter season scratches and dulls the floors. We can give you a free estimate for getting your floors back to that clean look with or without the shine depending on your needs. St. Albert Cleaning will assess and help you decide the best step of action. What is stripping and Waxing? Considered one of the toughest jobs in the cleaning industry, the use of a buffer is necessary to strip the floor of the old wax and dirt the floor may have. After the floor is completely stripped of the debris, soil and old wax, then several coats of waxing is applied. How much does stripping and waxing cost? Most cleaning companies will give you a cost per square foot. The are several considerations that apply when pricing a job. Shape of the floor, ease of access in terms of things that have to be moved, and the desired end result in terms of wax thickness will all influence the job price. 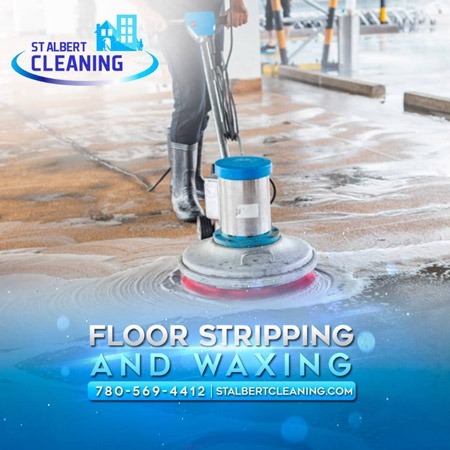 We take a different approach at St. Albert Cleaning. Give us a call or fill out the quote form and we’ll come out and give you the best cost-effective quote for the job. What are the tools required for stripping and waxing floors? A floor buffer and a variety of scrapers and pads may be used by your the cleaning company you use. After the floor is completely free of soil and debris, plus all the old was removed, then a series of wax coats are applied to the floor to protect the surfaces again. What are the steps for stripping and waxing floors? Ideally, the surface is clear of furniture and carpets. The less the cleaning company has to move, the lower the cost will be for a stripping and waxing job. It is also important to determine the areas that will need to be stripped and waxed. Most of the time this type of work is done after hours or on weekends when noone is around since it requires time to dry. What type of floors can have stripping and waxing? Most businesses have floors that can be worked on. How long does it take to strip a waxed floor? In addition to how long it takes to strip a waxed floor, most people ask how long it takes before you can walk on a waxed floor. For the most part, plan to be off the floor being worked on for about 8 hours. Your cleaning specialist will advise you of the amount of time required to complete the job at hand. Proper timing is required to obtain the best results.